Let’s dabble in something a little more savory this week, shall we? I don’t know a thing about Asian food other than I like to eat it. Since I grew up cooking Italian foods, I’ve only recently attempted cooking my own versions of favorite Asian/American dishes at home. Teriyaki sauce is an easy and unintimidating way to get some of those Asian flavors at home without needing a screaming hot wok or a bunch of ingredients you can’t pronounce. I have most, if not all, of the ingredients in my pantry on a regular basis so chances are you do too. The recipe is by no means authentic, but it’s what I like. The sauce thickens enough to make a great a dip, but my favorite way to use it is as a marinade for chicken or pork. Just marinate your meat for 30 minutes to 1 hour, then throw it on the grill for a quick weeknight dinner packed with flavor! Don’t be intimidated by Hoisin sauce. It tastes a lot like barbecue sauce and can be found in the Asian or Ethnic aisle of most supermarkets. If you don’t want to buy one specialty ingredient, just omit the Hoison and use 1/4 cup soy sauce instead of 1/3 cup. Combine all ingredients except cornstarch and water in a small saucepan over medium heat. In a small bowl, combine cornstarch and cold water. Bring the soy sauce mixture to a boil, stirring occasionally. Add cornstarch mixture and stir constantly until sauce reaches desired consistency. Remove from heat and cool to room temperature. Use right away as a marinade or store in a tightly covered container in the fridge for up to a week. I love Hoisin Sauce (and Teriyaki Sauce, too)! I use Hoisin in a lot of my favorite stir fry recipes. I agree… no one should feel intimidated by it. 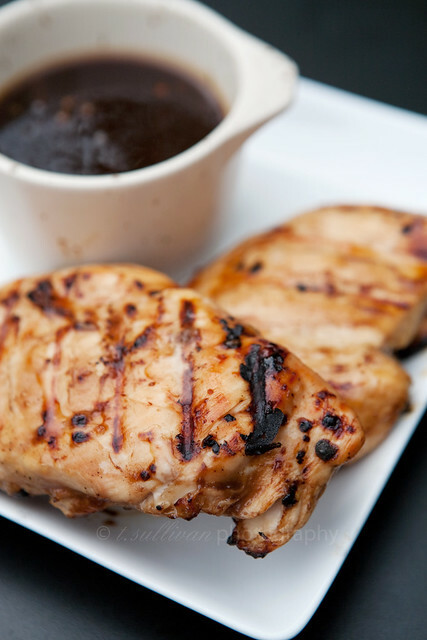 Teriyaki sauce seems easy enough! Don’t know why I’ve never tried making it from scratch! This looks like such a great dipping sauce.